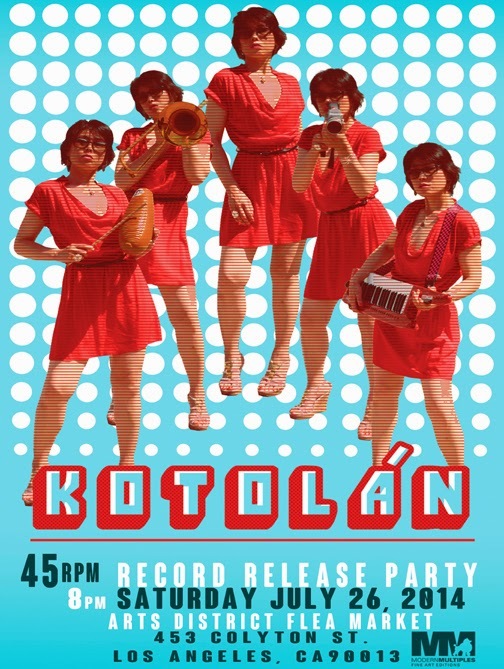 Indie Pop band Kotolán will host a record release party to launch their first boutique 45, a special limited edition vinyl record, with a performance on Saturday, July 26th at the unique Arts District Flea Market, 453 Colyton St. Los Angeles, CA 90013 in the heart of the LA’s Downtown Arts District, The record launch—an all ages, free event—will run from 8pm-11pm. Specialty mixology cocktails will be provided by Tito’s Vodka and Agetha Tequila. A Pop Up fine art station will feature collectible works from Modern Multiples, the legendary Los Angeles fine art print studio. The Modern Multiples Pop Up will be highlighted by pieces from artist Richard Duardo, the Andy Warhol of the West Coast, as well as images from and Royal Photography’s Michael Hope. A live performance by Kotolán begins at 9:30pm. A live performance by Kotolán begins at 9:30pm. Kotolán, an LA fusion ensemble with roots on the East Side and the Far East continues to deliver an eclectic sound rooted in 60s mod/soul and world rhythms with a heavy retro throwback feel. The special limited edition 45 offer a Side A sould track titled “Fate.” Side B, not to be outdone, is pressed with a song titled “Space Machine,” and afro-disco world beat original that is punctuated by stirring vocals from Japanese-born Kotolán lead vocalist Junko Seki. The 45 will be released at the show, and will be available for sale online at Bandcamp and iTunes. Led by singer Junko Seki and trombonist/songwriter Otto Granillo, two seasoned performers who are both highly accomplished veterans of LA’s diverse music scene, Kotolán has mesmerized audiences since their inception over a decade ago. Their first album La Tienda De Groove, released in 2011, showcases the band’s creativity and a gobal,multi-lingual vision that incorporates a vast arsenal of rhythms and traditions. As a result, the band has been invited to perform at an array of venues locally, including LACMA, the Autry Museum, Levitt Pavilion, UCLA and more.